(CNN) -- Paul Jessup is an avid reader who is increasingly turning to e-books to feed his love of the written form. It's not just ease of use that draws Jessup to books in a digital form, it's the potential e-books represent. 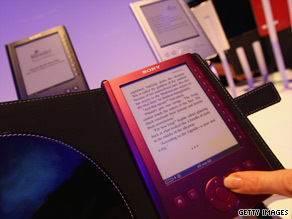 E-books, such as Sony's Readers, are less than 3 percent of the total publishing market, but are catching on fast. "It's much better for looking things up, since any e-reader's search function is 10 times better than flipping and looking and searching on my own" in a printed book, said Jessup, an Erie, Pennsylvania-based writer. He is one of a growing number of bibliophiles, spurred by new reading technologies like Amazon's Kindle, who are gravitating to the digital realm. Key developments in displays are improving e-book reading devices, whether it be E Ink's displays in products like the Sony Reader and the Kindle, or the easy on the eyes organic light emitting diode (OLED) screens being used in netbook computers and smartphones. Up-and-coming technology promises to enhance e-book reading even further. Low-power, reflective e-paper displays, which can be read in direct sunlight, are expected to hit the market in the next year from companies like Prime View International and Plastic Logic, said Nick Colaneri, director of the Flexible Display Center at Arizona State University. "At first these will be flat and largely indistinguishable from the displays in devices like Amazon's Kindle," Colaneri said. "But the availability of a new feature like mechanical flexibility always stimulates the creative energies of designers." Truly flexible displays could be available in three to five years, Colaneri said. Electronic readers could become as thin as a sheet of paper and able to contain hundreds of book titles, magazine articles and other content. Internet connectivity will go hand in hand with these devices, letting consumers download content from just about anywhere using Wi-Fi or mobile phone networks. In fact, they already can. The Kindle connects wirelessly to Amazon's store, allowing users to buy and download books to the device within minutes. Not to be outdone, Barnes & Noble recently launched its own e-book store and an e-reader app that allows users to download books to their smartphones. Last month, Sony announced its first e-book reader with built-in wireless capability. The Reader Daily Edition will sell for $399 when it debuts in December. Apple also is rumored to be working on a wireless tablet device with a large screen that would be better suited than an iPhone for reading digital content. It seems the time is right for these advances. E-book sales are seeing a significant upswing, said Hugh McGuire, CEO of Book Oven, an online company that builds Web tools for publishing e-books and print-on-demand titles. "The U.S. wholesale e-book market was about $50 million in 2008 (retail would be about double), but it's growing exponentially," McGuire said, citing figures from the International Digital Publishing Forum, a group that tracks the e-book market. McGuire said that in the first quarter of 2009, the wholesale market was about $25.8 million, an increase of 53 percent over the previous quarter. McGuire concedes that e-books are only 1 to 3 percent of the overall publishing market. But the success of the Kindle, and moves by Google -- who, along with Sony, is offering free titles online -- indicate a bright future, he said. "I would expect 20 percent of book sales to be digital by 2014, but some have predicted an even bigger percentage by then," he said. "Twenty percent of the current book market is something like $5 billion." That raises the question: What will happen to printed books? "E-books will gain, especially in the indie publishing market, making it far easier for a company or individual to sell a quirky, unique book for little money and see profits almost immediately," said Jessup, the Pennsylvania author and e-book reader. Even so, Jessup said he believes print and digital books will coexist for some time. He released his first work, "Open Your Eyes," as an e-book, but his publisher, Apex Books, lets buyers order the book via print-on-demand. It's also available on the Espresso Book Machine, an in-store device from On Demand Books that lets customers at independent bookstores print books. For e-books to reach their full potential, McGuire said, a shift in thinking is in order. "[Publishers] have long operated in an environment where printing a book was expensive," he said. "Shipping it around, stocking it in stores and selling it all represented significant costs. They still think in this mindset." Publishers need to realize that e-books can get titles to more readers for less money, he said. "Successful publishers will be those who embrace the benefits of e-books and pay more attention to what their readers want."